Thanks for sharing this! How do you extract the DAT file? I would like to modify the armor.am_dat file after changing the weapons. However, I can't find this file. I believe it should be in the same folder as weapons' DAT file(nativepc/common/equip). Could anyone let me know how to do that or just upload a armor.am_dat file without editing. Thanks! How do we do dual elements like with fire and ice daggers? can this be applied to other daggers? I would guess there is somewhere in the file that defines the elements as i doubt it is engine set as everything is defined in the dat files. we just need to figure it out a little bit more as we are just beginning to really see what is possible with this game engine. i think the skills limit is also somewhere in the files and we may be able to edit that to allow more than 33 armor based skills and/or set bonuses. Is it possible to get a variation of it with no weapon damage bonus and one with only like 25%/50% damage increase? If somebody interested, I've attached modded file with 125 each item carry capacity. Unpack "itemData.itm" from "itemData.zip" into "YourMonsterHunterWorldFolder\nativePC\common\item\itemData.itm" and enjoy. Last edited by WarStalkeR on Sat Sep 15, 2018 4:32 am, edited 1 time in total. Here is modded Bow Coatings file. Now each bow can use any coating. Of course, for sake of the "balance" I've made already existent bow coatings "empowered" and bows that had "empowered" coating from the beginning won't receive Close Range "empowered" coating, only normal one. 00 - coating not available, 01 - coating available, 02 - coating available and empowered. 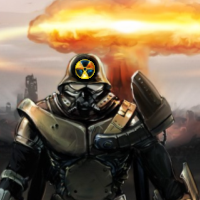 1st byte - Close Range, 2nd byte - Power, 3rd byte - Paralysis, 4th byte - Poison, 5th bytes - Sleep, 6th byte - Blast. 1st byte: defines ammunition amount. Using more then 20 (14 in HEX) crashes game to the desktop! Since I'm far away from game's end (I haven't even unlocked crafting for tier 4 and above), I can't release modded "shell_table.shl_tbl" where every bowgun can use every ammo type. However, I've attached original "shell_table.shl_tbl" file that anybody can change following my earlier explanation. First of all, you need Notepad++ to edit text and search for regular expression, and you also need HxD hex editor to edit read/write "shell_table.shl_tbl" file without harming data structure. Download "original_shell_table.zip" and unpack "shell_table.shl_tbl" to "YourMonsterHunterWorldFolder\nativePC\common\equip\" folder. 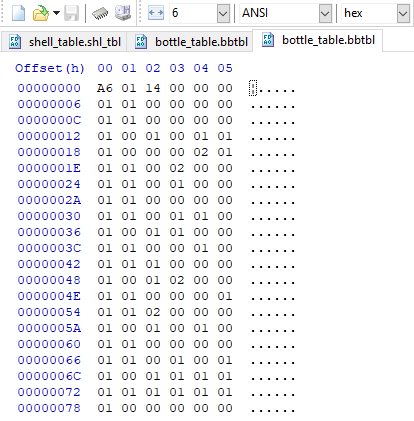 Open "shell_table.shl_tbl" with HxD and copy all HEX code into new Notepad++ text file. For example, you want to change bowgun that has 7x Normal I, 5x Normal II, 4x Normal III, 6x Pierce III, 8x Spread II. Search in text file via Notepad++ (using regular expression search mode) for "07.[0-F][0-F].[0-F][0-F].05.[0-F][0-F].[0-F][0-F].04.[0-F][0-F].[0-F][0-F].00.[0-F][0-F].[0-F][0-F].00.[0-F][0-F].[0-F][0-F].06.[0-F][0-F].[0-F][0-F].00.[0-F][0-F]. [0-F][0-F].08"
Do pay attention that if one or another type of Ammo is missing in the in-game list, you must remember to add 00 into search (just as in example at #4) to follow the sub-segment order. Also, do follow sub-segments order shown at the very beginning, although Wyvern Ammo is one of the last at in-game list, in segment it goes right after Cluster Bombs. After you found your bowgun's ammo segment, use earlier explanations as reference to change whatever you want. 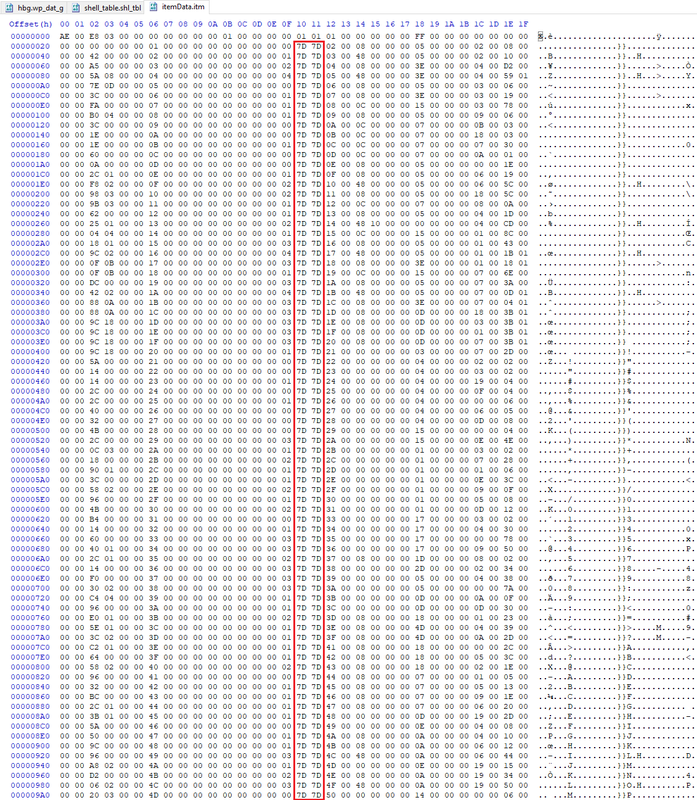 After you finished, don't forget to copy HEX text from Notepad++ to HxD and overwrite "shell_table.shl_tbl" file. Important Notice: Cluster Bombs only work with "Follow-Up / Mortar" shot types. I'm also not sure if you can add Cluster Bombs to Light Bowguns and make them work. 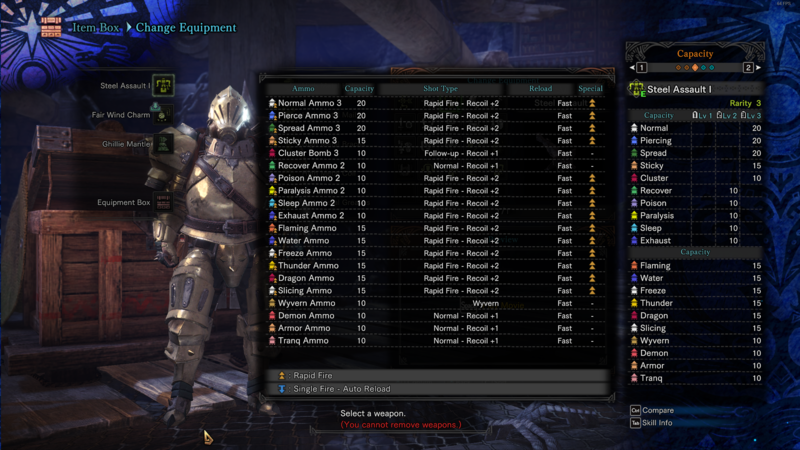 And DO NOT set more then 20 ammo for each type - game will crash to the desktop once you will try to use your bowgun. Now you can go Rambo with your favorite bowgun. Enjoy! Last edited by WarStalkeR on Mon Sep 24, 2018 7:05 am, edited 5 times in total. hi, i'm using your mode well. so fantastic, but how can i modify HBG and LBG damage double? i'm download hex edit and open your HBG,LBG file but i dont have Programming knowledge so i cant not modify my self, so would you modify double damge HBG,LBG mode upload or can you inform how can i modify?